ASPEN – Jon Peacock, former Mesa County administrator, has been named county manager in Pitkin County, succeeding Hilary Fletcher, who left the post in September. Peacock, 39, served in the Mesa County post from 2005 to 2010, stepping down in July to attend to family matters. 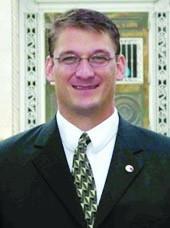 He had also been assistant county administrator in Mesa County for three years before being promoted. Working in Pitkin County is a unique opportunity, Peacock said Monday, reached by phone at his home in Grand Junction. “It’s probably right now the only job I would have come out of sabbatical for,” he said, citing the county’s “excellent reputation” and the unique government structure it has created through a home-rule charter. “That made the opportunity really attractive,” he said. Peacock is expected to begin his duties in early 2011, shortly after the holidays. Details of his contract are still to be negotiated, according to Commissioner George Newman, chairman of the Board of County Commissioners. The board had set a base salary of $135,000 for the post, with the ability for a candidate to negotiate higher pay. Peacock was the board’s first choice for the post after interviewing all five finalists on Friday, Newman said. Candidates were interviewed by a group of county staff members, and separately by commissioners, who were joined by Commissioner-elect Rob Ittner and four community representatives – Aspen Skiing Co. CEO Mike Kaplan, Aspen Valley Hospital CEO Dave Ressler, Aspen Chamber Resort Association President Debbie Braun and citizen Pam Cunningham. “We’re really excited about him and what he’s going to bring to the organization and the community as a whole,” Newman said. In his tenure at Mesa County, Peacock gained experience in issues that Pitkin County faces, including economic, public lands, environmental and water issues, Newman noted. Peacock said he plans to begin looking for a home, probably in the midvalley, for his family; he is married and has two daughters, ages six and eight. “We’d like to be in Pitkin County – I have a thing about living in the county that I’m serving,” he said. Peacock is an avid mountain biker, and he and his family are skiers, hikers and backpackers. “We actually just bought new ski boots just before the interview,” he said. Also interviewed for the manager’s post were: Phylis Mattice, internal services director for Pitkin County and its interim manager; Tom Baker, town manager in Carbondale; Scott Vargo, assistant county manager in Summit County; and Frank Lancaster, county manager in Larimer County. While at Mesa County, Peacock was named the 2007 County Administrator of the Year by the Association of Colorado County Administrators. He grew up in Colorado Springs and attended the University of Wyoming, where he taught political science and public administration.